There are lots of coaster parks in the world, but few have dedicated themselves to pushing the limits of thrill rides like Cedar Point in Sandusky, Ohio, has. 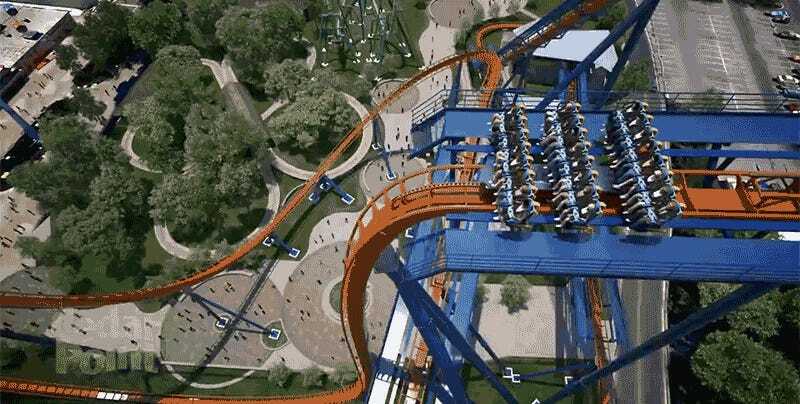 And when it opens next summer, its new Valravn Birdseye coaster will officially break ten world records in one fell swoop. Though the park has a relatively small footprint, over the years Cedar Point has found room for some of the most terrifying roller coasters you could ever strap yourself into. And the 3,415 feet long Valravn Birdseye continues that tradition with a record-setting 214 feet, 90-degree initial freefall that sees the coaster hitting 75 miles per hour. Designed and built by Bolliger & Mabillard in Monthey, Switzerland, Valravn Birdseye is the 100th coaster the firm has created, and it will claim ten different world records once it goes into operation next summer. Once running, there are probably other records the coaster will claim too, like most vomit produced, or most pocket change dumped onto the ground below. But if you just can’t wait until 2016 to try it out, Cedar Point has also created a first-person VR video of the ride that you can pan and zoom in your browser, or watch using a VR headset via an app that’s available for download right now. On second thought, maybe we’ll just stick with the bumper cars.